Centsible Savings: Thrifty Thursday: I reallllly love white! Thrifty Thursday: I reallllly love white! She had a $2.00 price tag on each piece but I offered her $4 for all 3 – she willingly obliged! I have got to find more fillers to put in my white containers! :) I think a trip to IKEA might be in order, since I love their little artificial plants. 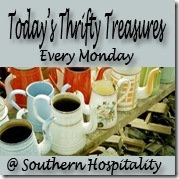 What thrifty finds did you find this week? Linking this post up to Rhoda’s Thrifty Treasure party! Join us on our *new* facebook page! $3.00 off any 1 Huggies! CVS deals (5/15 – 5/21): Cheap sunscreen! All You magazine on rollback! FREE custom t-shirt from Vistaprint! Walgreens: 2 FREE 8x10 collages!! Thrifty Thursday: my new favorite color! Get Right at Home coupons! Swagbucks: Lots more gift card options!! !